Job:40:15 Behold the behemoth, which I made with you: he eats grass as an ox. 16 Behold please, his strength is in his loins, and his force is in the navel of his belly. 17 He delights his tail like a cedar; the sinews of his fear are woven together. 18 His skeleton is rivers of brass. His bones are like bars of iron. 19 He is the first of God's ways, made to make His angels laugh. 20 For the mountains bring him forth food, where all the beasts of the field play. 22 Lotus-bushes cover him with their shade; the willows of the brook surround him. 23 Lo, the river overfloweth -- he startleth not: he is confident though a Jordan break forth against his mouth. What is the Behemoth in Job 40:15-24? v15. "behemoth" appears in Scripture 11 times. In all places except for this one, it means "beasts" plural, but here it refers to a singular animal. "which I made with you" - Behemoth is not a mythical creature. God made him to exist at the same time as mankind. Why did God say, "with you"? Because God had made creatures in past ages that were not with man. This creature is on earth at the same time as man. The 1st and most striking characteristic of Behemoth is that he eats grass like a cow. It is very unlike a cow, yet eats grass like a cow. It is not just that it is an herbivore, and not just that it eats grass, but the way it eats grass looks like the way a cow eats grass. What creature is unlike a cow, yet eats grass like a cow eats grass? 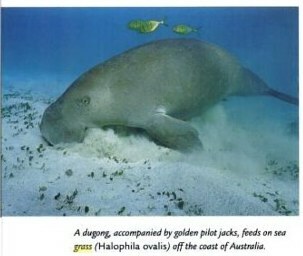 The manatee or dugong or sea cow eats sea grass in a similar manner to how a cow eats grass. When Georg Steller discovered the Steller Sea Cow, after remarking about it's gigantic size (30 feet), he then said "it eats grass like a cow". 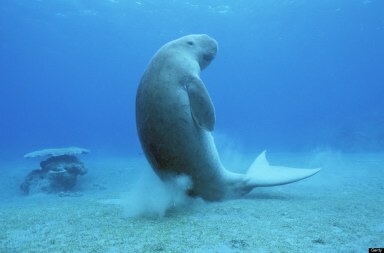 The Sea Cow is a gigantic dugong, with the adaption of huge size to survive in the subarctic. v16. The word "navel" would prove that the behemoth is not a dinosaur because only mammals have navels. Dinosaurs were egg layers, and thus did not have navels. The Hebrew word here for "navel", sharir, seems to be an alternate spelling of shar, which is the normal word for navel (Prov 3:8; Sol 7:3; Eze 16:4). LXX, KJV and the Orthodox Jewish Stone Tanach translate it as "navel". Because it is an alternate spelling, I couldn't say for sure that the word means "navel". I see no good basis for translating it as "muscles" as modern translations do. Many animals have strength in their loins, but the behemoth also has his power in his navel, signifying the belly and that he has a navel. Most creatures have weak underbellies. The only creatures that have their power in their bellies are marine mammals because they propel themselves by moving their tails up and down by contracting and expanding the belly muscles. One may think that power in the navel may also indicate that this creature eats a lot. Georg Steller said that the sea cow ate non-stop, but that is not what the verse is referring to because it says it is his force that is in his navel. Manatees like to show off their bellies. They often swim upside down. v17. 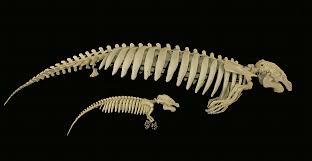 The only mammal with a huge tail and that eats grass is the sea cow family. The elephant and hippo are further eliminated by this statement. They also do not eat grass like a cow nor have their force in their belly. He (literally) delights his tail. I think this means that he shows happy emotions by moving his tail like a dog, seal, whale, dolphin or pig. 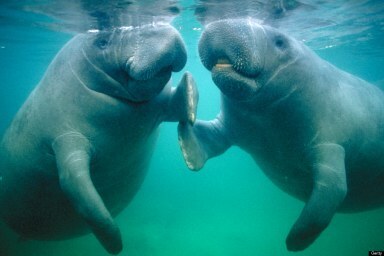 I do not know if manatees or dugongs do this, but they are affectionate and always seem to be happy. Most modern versions translate "fear" as "thighs", which it does not mean. The word is used 76 times in the Old Testament including 15 times in Job and is always translated similar to fear, dread or trembling except here. KJV translated it as "stones" (testicles) following the Latin Vulgate, but there is no basis for that translation. LXX translated it as "nerves" which goes along with "fear". This indicates that he tenses his muscles when afraid, not to attack. 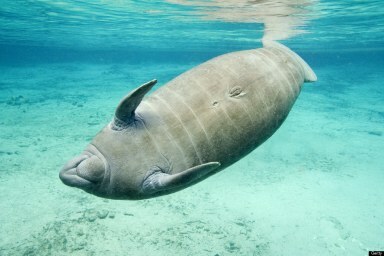 A manatee normally moves about 5 miles/hour. When frightened he can go 25 mph. His great strength in the previous verse in his belly and here when afraid is for moving his great tail. Because they are used for swimming, his skeleton flows like a river of brass. Brass is springy (Ps 18:34). v19. He is the first or beginning of God's ways because of his gentleness and harmlessness. Georg Steller wrote how they were affectionate and helped eachother when one was in trouble. The 2nd 1/2 of the verse is hard to translate. The Hebrew text says literally, "who was made. He will approach his sword". The LXX says ""made to be played with by His angels". It seems that the LXX saw a different Hebrew text. I took a pretty wild guess that LXX saw, harabo, his many, instead of charbo, his sword, and interpretted "His many" to mean "His angels", which is a stretch, but its the best I can come up with. and my arms to bend a brass bow.